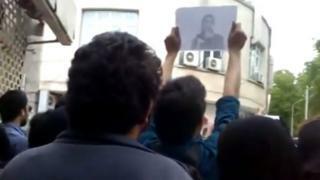 Relatives of Iranian political prisoners have held a protest outside the office of President Hassan Rouhani. An opposition website has reported that several inmates at Evin Prison in the capital, Tehran, were beaten during an inspection last Thursday. Presidency officials are said to have discussed the incident with some of the relatives after Tuesday's protest. Several MPs have called for an inquiry into the alleged beatings, which have been denied by prison officials. "The families asked us for help and we do so as much as we can,'' Ali Motahari, one of the MPs who called on the justice minister to investigate, told the semi-official Isna news agency. A video posted online on Tuesday appeared to show protesters outside the president's office, holding banners and chanting: "Evin has become Palestine. Government, why are you sitting around doing nothing?" The opposition website Kalame.com said five representatives of the prisoners' relatives were later invited to attend talks. The details of what happened during the prison inspection are disputed. Kalame reported that the political prisoners were beaten when a clash erupted during a snap inspection of Ward 350 by the prison authorities. About 100 guards in riot gear were said to be involved. Thirty inmates were allegedly injured, four of them so severely that they required treatment at an outside hospital. Prison officials have denied there was a clash or that anyone was beaten. Justice Minister Mostafa Pourmohammadi insisted that it was "just a routine inspection" that met with some "resistance". "Only one or two prisoners suffered minor injuries", he said. Two MPs, Hasan Asafari and Ismail Kowsari, accused some of the prisoners of illegally possessing mobile phones and laptop computers, and of refusing to give inspectors access to their cells. Human rights activists have accused the Iranian authorities of regularly subjecting prisoners, especially those convicted on politically-motivated charges, to abuse and of depriving them of necessary medical treatment. Seven political prisoners are thought to have died as a result of torture, ill-treatment, or medical neglect since 2009, when millions protested after the disputed re-election of former President Mahmoud Ahmadinejad.